Kitchen Knife Sharpener Just $13.99! Down From $38! PLUS FREE Shipping! You are here: Home / Great Deals / Amazon Deals / Kitchen Knife Sharpener Just $13.99! Down From $38! PLUS FREE Shipping! Right now at Amazon, you can get this Kitchen Knife Sharpener for just $13.99 down from $38 PLUS FREE shipping! 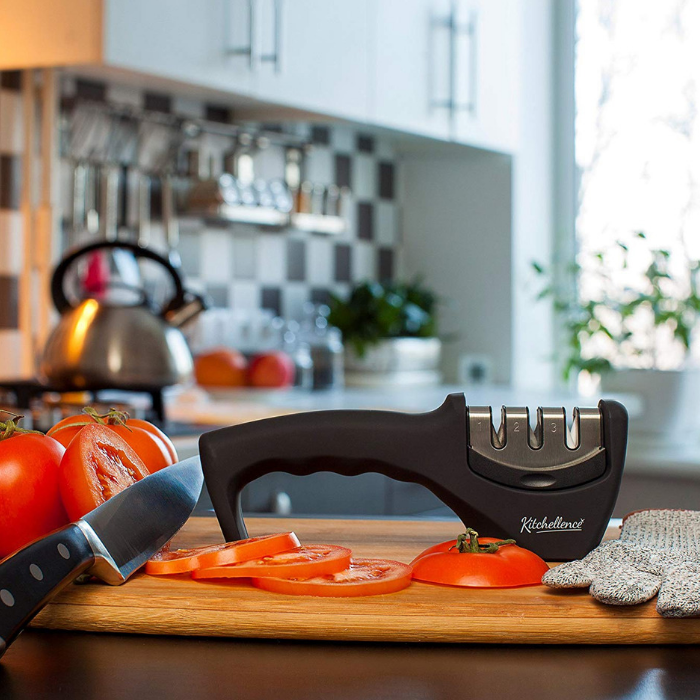 Keep cooking fun, safe and healthy with this Knife Sharpener! This 3-step system begins with a diamond sharpening rod slot that gently repairs and straightens damaged blades. You can even use it for ceramic knives! Next, tungsten steel provides coarse sharpening that restores the blade to a V-shape before the 3rd slot creates a stunning polish. Whether you’re a cooking novice or a professional chef, our sharpener is quick and easy to use! Premium Quality: With our professional knife sharpener kit, you don’t have to be a chef to cook like one! Crafted from solid ABS plastic, it’s strong, durable and designed to last a lifetime. Made with high quality materials, knives will work like new.